Online polemics are raging in China over the design of a monkey-like mascot for the state TV's annual Lunar New Year gala heralding the Year of the Monkey. Web pic shows the state TV's gala moscot for the Year of the Monkey. 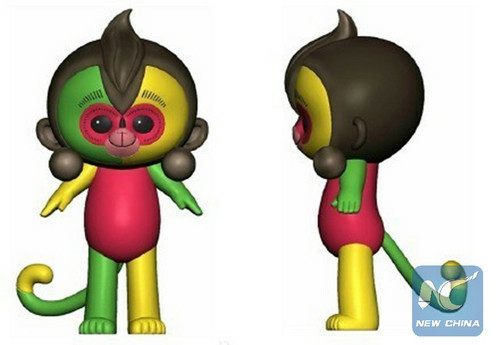 Shortly after the design of the mascot was unveiled on Thursday, criticism began to flood social media, with many claiming that the 3D animation version uglified the original design of a cute monkey. The mascot, named Kangkang -- "healthy" in Chinese -- stands with its arms extended. Its right cheek, left arm, right leg and upper part of the tail are green, while the left cheek, right arm, left leg and tip of the tail are yellow. The center of its face and its body are red. Many web users were far from happy with the new mascot. "The monster of traffic lights!" said one. Another reckoned it "was designed by a traffic cop." One photoshopped picture circulating online shows the mascot hanging at a busy crossing. Another image was created by putting together kiwifruit, lemons, apples, cherries and almond. Though declining in popularity in recent years, the Spring Festival TV gala on China Central Television has been an indispensable part of many people's celebrations since it was first aired in 1983. Last year's mascot, a sheep, was the first such motif to be featured on the show. In response to the controversy, designer of the original version Han Meilin, a renowned Chinese artist who came up with the mascots for the 2008 Beijing Olympics, said through the Wechat account of his foundation that he was only responsible for the monkey's head and had no idea how the final version came about. Some people who showed tolerance of the design. "I think the original painting of the monkey's face is OK, before they made it into a figure," said one forgiving soul. Of the 12 animals in Chinese horoscope, the monkey is seen as a symbol of wisdom. The most famous monkey in China is perhaps the Monkey King, a character in the classic epic "Journey to the West," and a legendary hero most Chinese have known since childhood. Seemingly omnipotent, he accompanies his master on a pilgrimage to India, slaying many monsters along the way. Han claimed his design combines Chinese tradition with the carnival atmosphere of the gala, blending perky and childish traits with the Monkey King character. "I would like to take this chance to promote the image of monkey as a Chinese cultural icon around the world," he said. "Disney is famous for a mouse. So why should't we create a monkey?"